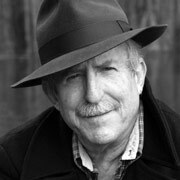 Tom Raworth was born in London in 1938. Having left school at the age of sixteen, he has been publishing poetry since the early 1960s, when he started the magazine Outburst and Matrix Press. With Barry Hall he established Goliard Press in 1965. His first book, The Relation Ship (1966), won the Alice Hunt Bartlett Prize. Raworth briefly attended the University of Essex from 1967–70, and then lived in Ohio, Chicago, Texas, and San Francisco. He returned to England in 1977, where he was poet in residence at King's College, Cambridge. Raworth's prodigious output (publishing a book or more per year for several decades) can be encountered in his 650-page Collected Poems (Carcanet, 2003). A collection of prose, Earn your Milk, was published in 2009. In 2007 he was awarded the Antonio Delfini prize for lifetime achievement, in Modena, Italy. He regularly performs his work throughout Europe and the US, and has collaborated with a range of musicians and visual artists. His visual art consists mainly of drawings, collage and found art and has been exhibited in Italy, France, South Africa, and the United States. Some examples can be found at tomraworth.com. The Archive is very grateful to Cafe Oto for supplying this recording, of a performance at Cafe Oto on 20 March 2012 by Thurston Moore, Tom Raworth, Alex Ward and Steve Noble. This recording was made at the Cambridge Women's Experimental Poetry festival, held 6-8 October 2006 in Cambridge, UK and organised by Emily Critchley and Catherine Brown. Recorded on 4 March 2006, at Woodland Pattern, Milwaukee, with the saxophonist Steve Nelson-Raney. Weapon Man (broadside) (London: Goliard Press, 1965). The Relation Ship (poems). Illustrated by Barry Hall (London: Goliard Press, 1966; second ed. London: Cape Goliard and New York: Grossman, 1969). Haiku (poems: with John Esam and Anselm Hollo) (London: Trigram Press, 1968). The Big Green Day (poems). Illustrated by Jim Dine. (London: Trigram Press, 1968). A Serial Biography (prose). (London: Fulcrum Press, 1969). Lion Lion (poems : miscellaneous illustrations) (London: Trigram Press, 1970). Moving (poems). Illustrated by Joe Brainard. (London: Cape Goliard and New York: Grossman, 1971). Tracking (poems/notebook). Cover by Fielding Dawson. (Bowling Green, Ohio: Doones Press, 1972). Here (poems). Cover by Lloyd Raworth. 40 copies privately printed. (Bowling Green, OH: Doones Press, 1972). Pleasant Butter (poems). Cover by Charles Simonds. (Paris and Northampton: Blue Pig Press, 1972). Betrayal (prose). (London: Trigram Press,1972). Act (poems). Illustrated by Barry Flanagan. (London: Trigram Press, 1973). Back to Nature (poems). Cover by Pip Benveniste. (London; Joe DiMaggio, 1973). From the Hungarian (translations) (with Val Raworth). 40 copies privately printed. (Bowling Green, OH: Doones Press, 1973). An Interesting Picture of Ohio (Bowling Green, OH, 1973). Ace. Illustrated by Barry Hall (London: Goliard Press, 1974). Bolivia another end of Ace (London: Secret Books, 1974). Cloister. Cover by Michael Myers (Paris and Northampton: Blue Pig, 1975). Common Sense. Illustrated by Michael Myers (San Francisco: Zephyrus Image, 1976). The Mask. Illustrated with masks found by Alastair Johnston (Berkeley, CA: Poltroon Press, 1976). Four Door Guide. Cover by Gerhardus Mercator; illustration by the author (Cambridge: Street Editions, 1978). Sky Tails (Cambridge: Lobby Press, 1978). Nicht Wahr, Rosie? (Berkeley: Poltroon Press, 1979). Writing (Berkeley, CA: The Figures, 1982). Levre de Poche (Durham, NC: Bull City Press, 1983). Heavy Light. Cover by Lloyd Raworth (London: Actual Size Press, 1984). Tottering State : Selected and New Poems 1963--1984. Cover by Eric Fischl. (Berkeley, CA: The Figures, 1984). Tractor Parts (Peterborough: Spectacular Diseases, 1985). Lazy Left Hand. Cover by Lloyd Raworth (London: Actual Size Press, 1986). Visible Shivers. Cover by Jean-Luc Guerin, illustrations by the author (Oakland, CA: O Books, 1987). Tottering State: selected poems 1963--1987 (London: Paladin Books, 1988). Sentenced he gives a Shape (Tenerifce: Zasterle Press, 1989). From Eternal Sections (Dublin: Hardpressed Poetry, 1990). Catacoustics (Cambridge: Street Editions, 1991). All Fours (London: Microbrigade, 1991). The Vein (Massachusetts: The Figures, 1992). Blue Screen (Cambridge: Equipage, 1992). Eternal Sections (Los Angeles, CA: Sun & Moon, 1993). Emptily (Massachusetts: The Figures, 1994). The Mosquito and the Moon (Cambridge, 1994). Silent Rows (Massachusetts: The Figures, 1995). Muted Hawks. Illustrations by Alastair Johnston (Berkeley: Poltroon Press, 1995). Frames. Italian translation by Dario Villa; cover by Gianni Castagnoli and illustration by Franco Beltrametti (Riva san Vitale, Switzerland: Giona Editions, 1995). Clean & Well Lit (selected poems 1987--1995) (New York: Roof Books, 1996). Etruscan Reader V (Etruscan Books, 1998). Meadow (Sausalito, CA: Post-Apollo Press, 1999). Tottering State (Berkeley, CA: O Books, 2000). Landscaping the Future (bilingual Italian/English) (Bologna: Porto dei Santi, 2000). Ace (Washington, DC: Edge Books, 2001). Collected Poems (Carcanet Press, 2003). Caller and Other Pieces (Washington, DC: Edge Books, 2006). Let Baby Fall (Providence, RI: Critical Documents, 2008).